Chef and Co-Owner, Justin Miles, and his team have been winning awards for their delectable contemporary Australian cuisine for over 30 years. The list of highlights include being named Australia's best Tourism Restaurant 2016, as well as South Australia's Best Restaurant Caterer 2015, 2017 and 2018. WHEN: Friday, 10th May 6:30pm. The Geber family invite you to join us in Sydney for the official release of the Old Vine Expressions collection for 2019, as well as the iconic The Everest Shiraz for the 2015 vintage on 16th October 2019. 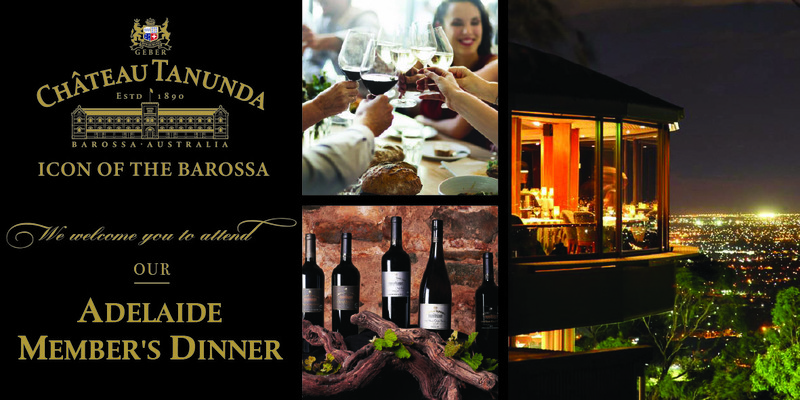 As a close friend of Château Tanunda you have the opportunity to taste this wine and the new range of Old Vine Expressions wines with this priority invitation to the ChâteauTanunda 2018 Luxury Release Tasting at a venue to be confirmed. Join the Geber family with senior winemaker Neville Rowe for an exclusive informal tasting of the new release The Everest Shiraz 2015,The Everest Grenache 2016 and a selection of our Old Vine Expressions including the 100 Year Old Vines Shiraz 2016, 50 Year Old Vines Cabernet 2017 and 150 Year Old Vines Semillon 2019. Limit of 6 tickets per booking. Join us at in Brisbane city for a wine club only tasting of the latest vintages of the Grand Barossa, The Chateau and Old Vine Expression wines. Open to Everest and Loyalty Wine Club members, as well as Friends of the Chateau Mailing List Members and up to 5 guests.